The Configuration Wizard provides you with an easy and straight forward way for setting up your RadPivotGrid control. You can set up and control the structure and main functionalities from here. 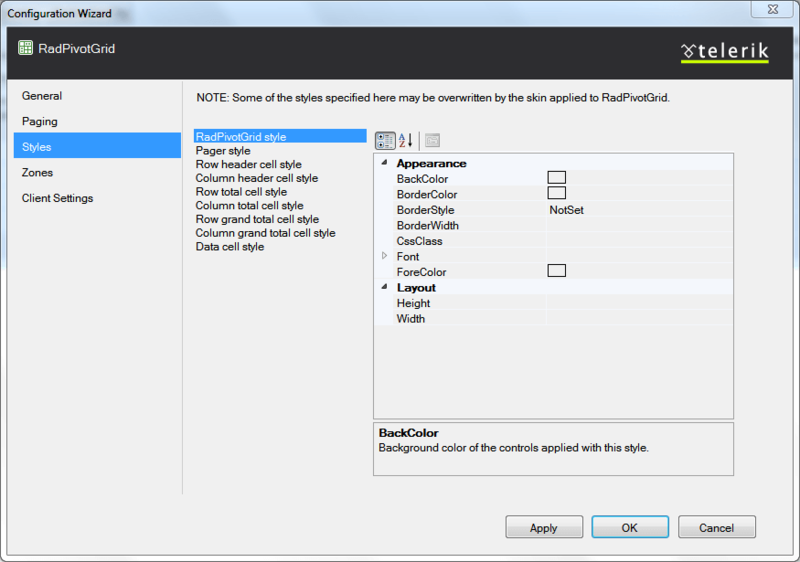 Data - shows a dropdown where you can pick the ID of the declarative data source to which RadPivotGrid should be bound. 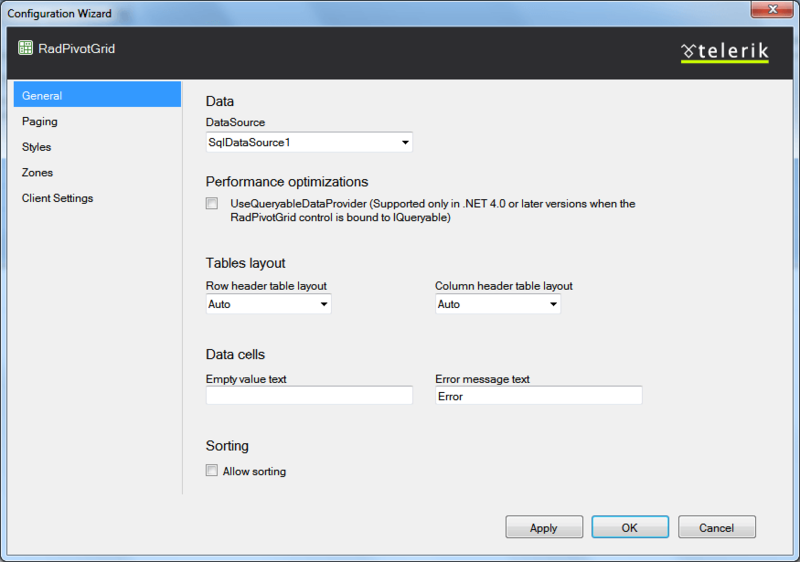 Performance optimizations - here you can enable the usage of a queryable data provider when binding RadPivotGrid in .NET 4.0 or later. Tables layout - two dropdowns let you choose the table-layout setting of the tables displaying the row and column headers. Data cells - shows two textboxes. In the first one you can write a custom text which will appear when an aggregate cell has no value; in the second you can put in the text to show in aggregate cells whenthere was an error during calculation. Sorting - displays a checkbox which you can use to enable and disable sorting in RadPivotGrid. Paging - shows a checkbox used to enable and disable paging and a numeric box which lets you set the page size of the control. Page Navigation - allows you to customize the navigation options in the RadPivotGrid pager.The Always show navigation checkbox is used to decide whether the pager will be displayed when the items in RadPivotGrid are less than the page size.There are also two dropdowns that let you choose the position of the pager inside the rendered pivot grid and its mode. Here you can customize the styles applied to RadPivotGrid. There is a separate property grid for the whole pivot grid and for each logical structure of the control. For information and code samples of how you can apply custom styles based on different criteria inside RadPivotGrid,check Conditional Formatting. Show/Hide Zones - shows a checkbox which corresponds to the visibility of each of the three header zones - column, row and data. 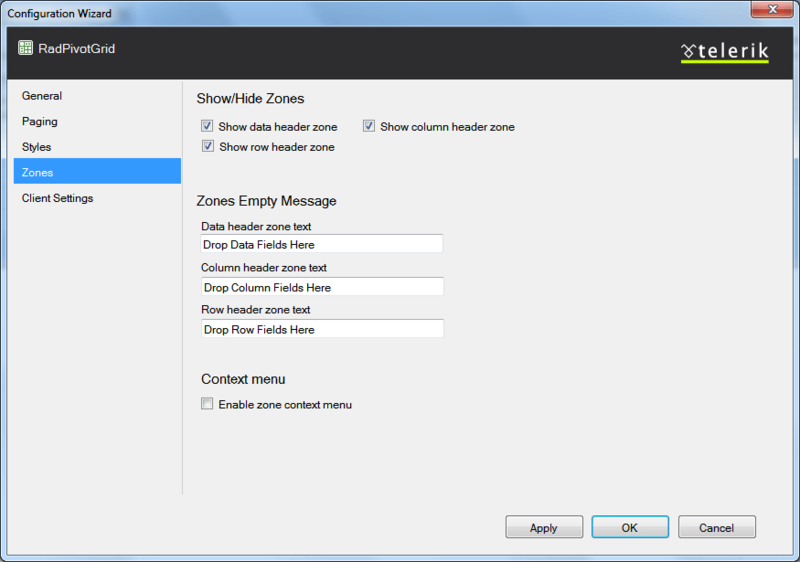 Zones Empty Message - allows you to provide a text for each zone which will be displayed in it if no fields are included in it. ContextMenu - shows a checkbox allowing you to enable or disable the zone context menu. You can see how zones and the zone context menu are used in the First Lookdemo of RadPivotGrid. 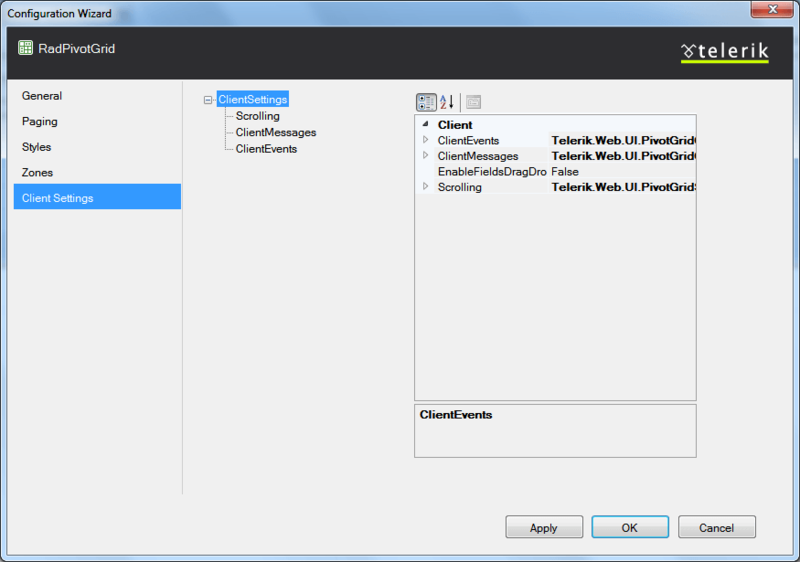 From here you can enable and disable all client features of the control, attach client events and control the text of client messages. This section shows a property grid for all ClientSettings in RadPivotGrid and for each sub class of settings - the ClientEvents, Scrolling settings, etc.